Effective January 1, 2015, California will have a new official state amphibian: the California red-legged frog. On Saturday, June 28, 2014, Governor Jerry Brown signed Assembly Bill No. 2364 designating the California red-legged from the official state amphibian of California. Perhaps best known for its probable appearance in Mark Twain's short story "The Celebrated Jumping Frog of Calaveras County," the California red-legged frog (Rana draytonii) is the largest native frog in the western United States and is almost exclusive to California. During the Gold Rush, miners ate nearly 80,000 frogs per year. Recent development and competition from invasive species have also been hard on the California red-legged frog. It has lost 70 percent of its former habitat range, and in 1996, the U.S. Fish and Wildlife Service listed it as a threatened species under the Endangered Species Act. 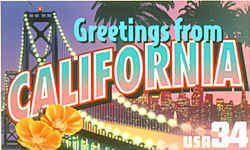 It is now found primarily in coastal regions from Marin County to northern Baja California. The idea for an official state amphibian was initiated by Sea View Elementary School 3rd grade teacher Virginia Haddad and students from the "Prodigy Cats" after-school club. Assembly Bill No. 2364 was introduced to the California General Assembly, by Assembly Member V. Manuel PÃƒÂ©rez on February 24, 2014. The California red-legged frog, (Rana draytonii,) is a species of frog, that is now endemic to California. 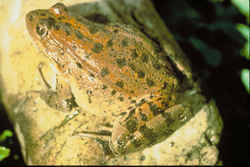 It was formerly considered a subspecies of the northern red-legged frog (Rana aurora). The frog is an IUCN vulnerable species, and a federally listed threatened species of the United States, and is protected by law. This frog species is named appropriately! It has a reddish coloring on the underside of the legs and belly. A California red-legged frog's back and head can range from red to brown and/or gray. The back and top of the legs are covered in small black spots and large dark blotches. Typically, the face has a dark mask and a tan or light colored stripe above the jaw that extends to the shoulder. The California red-legged frog has folds running down the side of its back, rough skin and partially webbed toes. 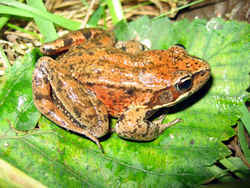 Size: The California red-legged frog is 2-5 inches long. It is the largest native frog in the western United States. Diet: California red-legged frogs will eat just about anything they can catch and fit in their mouths. 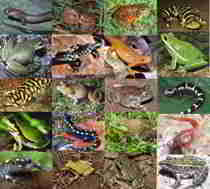 Most of the time, they eat invertebrates, but on occasion, they will consume smaller amphibians and mammals. Typical Lifespan: They can live upwards of 10 years in the wild; however, it is suspected that many do not live that long. 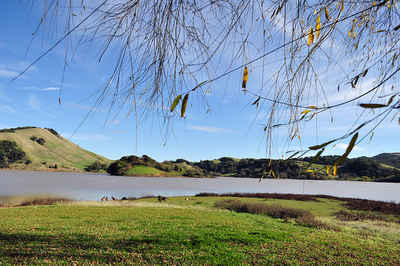 Habitat: Usually found near sheltered ponds or other permanent water with extensive vegetation. Also seen during rains traveling over land between ponds or other waters. Range: Historically, throughout Central Valley and Sierra Nevada foothills south to to n. Baja California. Now found from Sonoma and Butte Counties south to Riverside, but mainly in Monterey, San Luis Obispo, and Santa Barbara Counties. 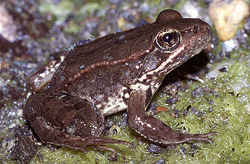 Life History and Reproduction: California red-legged frogs begin breeding around November and continue through April. The males arrive at the breeding grounds early and sit in groups calling to females. The females lay large egg masses and the males fertilize the eggs. The eggs hatch and the larvae go through metamorphosis throughout the summer. California red-legged frogs are mainly solitary during the year and active at night. They do not like very hot temperatures and will seek shade within tall grasses and reeds. 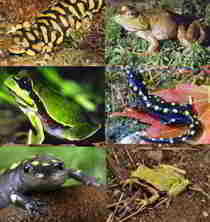 The main predators of California red-legged frogs are birds, raccoons, snakes and the invasive exotic American bullfrog. Assembly Bill No. 2364 was approved by a full vote of the Assembly on April 24, 2014 and the Senate approved the bill on June 19, 2014. Assembly Bill No. 2364 was introduced to the California General Assembly, by Assembly Member V. Manuel P?ez on February 24, 2014. On Saturday, June 28, 2014, Governor Jerry Brown signed Assembly Bill No. 2364 designating the California red-legged frog the official state amphibian of California. An act to add Section 422.7 to the Government Code, relating to state government. (a) The California red-legged frog is the largest native frog in the western United States and is found almost exclusively in California with a few sightings in Baja California and Mexico. (b) The California red-legged frog is particularly well known as a result of Mark Twain's famous short story "The Celebrated Jumping Frog of Calaveras County,"which featured the species. (c) The California red-legged frog's unique place in California's history extends as far back as the 19th century Gold Rush. Miners, known as forty-niners, consumed nearly 80,000 frogs per year, nearly eating the species into extinction. (d) While the California red-legged frog no longer has to fear the fork, the species continues to face myriad natural and manmade threats, including the introduction of invasive species into the California red-legged frog's habitat, as well as habitat loss. In fact, according to the United States Fish and Wildlife Service, populations of the California red-legged frog have disappeared from nearly 70 percent of its historically known habitat. In May 1996, the species was listed as a federal threatened species, with the state also classifying it as a species of special concern and subject to protection in June 1996. (e) Declaring the California red-legged frog as the official state amphibian of California will acknowledge the species' important place in the ecology, culture, and history of California, as well as broadcast and reinforce the state's commitment to protecting endangered species. 422.7. The California red-legged frog (Rana draytonii) is the official state amphibian. The law designating the California Red-legged frog as the official California state amphibian is Section 422.7 of the California Government Code, specifically California Government Code, specifically Title 1, Division 2, Chapter 2, Section 422.7.